. إن Chermside Motor Inn حريص على توفير الراحة للنزلاء، فلا يوفر الموظفون جهداً في تقديم أفضل الخدمات وضمان حسن الاستقبال. يمكن لضيوف الفندق الاستمتاع بالميزات التالية على أرض الفندق: واي فاي مجاني في جميع الغرف, مرافق مخصصة لذوي الاحتياجات الخاصة, تخزين الأمتعة, واي فاي في المناطق العامة, صف السيارات . استمتع بوسائل الراحة الراقية في الغرف أثناء إقامتك هنا. بعض الغرف تتضمن تلفزيون بشاشة مسطحة, اتصال لاسلكي بشبكة الإنترنت (مجاني), غرف لغير المدخنين, مكيف هواء, تدفئة لمساعدتك على استعادة طاقتك بعد يوم طويل. صممت خدمات الاستجمام في الفندق والتي تتضمن حمام سباحة خارجي, حديقة لمساعدتك على الاسترخاء والراحة. 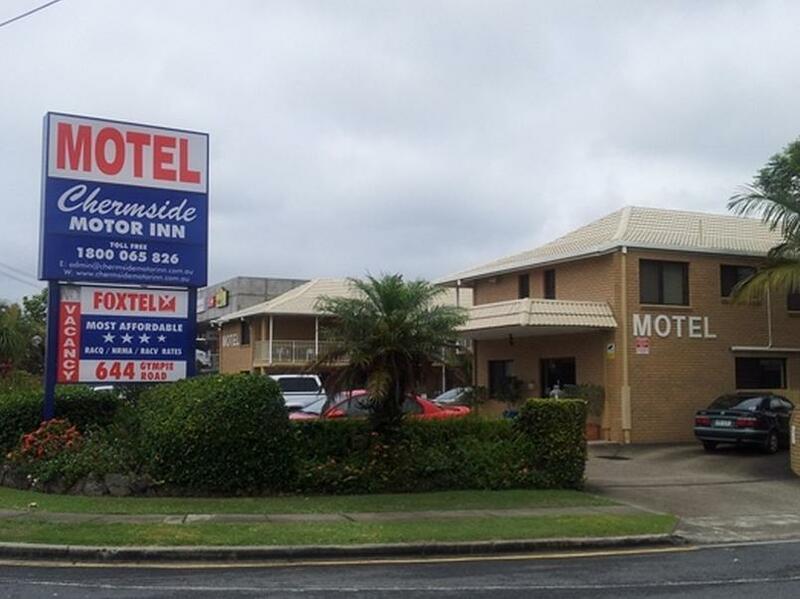 مهما كانت أسبابك لزيارة بريسبان، فإن Chermside Motor Inn هو الخيار الأفضل لإقامة مثيرة وممتعة. يرجى العلم أن الإفطار يقدم عمد الطلب ومقابل رسوم إضافية. مكتب الإستقبال مفتوح من 07:00 صباحاً إلى 07:00 مساءً. الضيوف الذين سيصلون خارج هذا الوقت يطلب منهم التواصل مع العقار مباشرة قبل موعد الوصول لترتيب هذا الأمر. No cons- we had a comfortable stay and would recommend to anyone for short term accomadation. Good value. Great pool and high standard of accomodation and service. This motel was centrally located for my business trip. Large shopping centre in walking distance. Comfortable bed, good amenities, small fridge and kettle in the room. Not to noisy even though it is on a busy main road. Location was good for us. Staff were good to us also. Cleanliness was ok, bleach left everywhere in bathroom and stained clothes when using amenities, area of hotel is perfect. Receptionist was wonderful and helpful. Owners incredibly rude, asked for more towels as my daughter was sick and was told we already had 2 towels in the room and could only have one more, (we had 3 people) and tried to explain and was told that we had to buy our own if we wanted more. Free internet is capped at 500mb per day, then you have to pay when it runs out. All "5 austar channels" did not work. I was hesitant re traffic noise but with double windows it was not a problem. Good beds, near everything including Prince Charles Hospital. I had to book in early due to hospital appointment but it was no problem. Very clean and comfortable to stay. Despite the motel is a bit old, it's surprisingly very tidy and clean. Definitely coming back. What a great motel. The owners are very committed to ensuring their guests have the best possible stay. Stayed 6 nights. 15 minute walk to hospital. Perfect stay if recovering from surgery. Plenty of shops and food next door. Excellent value for money. Would definitely stay again. Clean facilities and friendly advice and help. Handy to our destination. Very clean. One of the best. Have recommended to a number of other people. Slightly over my rm price expectation but overall I like motor inn for a week or so for family holiday. Good Location close to amenities. Swimming Pool is very nice. Nice managers - family owned. Spotless pool and everything we needed in the room for a comfortable stay. Staff were very friendly and helpful. Good size rooms and clean. Enjoyed my stay. Very friendly and understanding hosts at a difficult time. Lovely room, comfy bed, close to everything. We'll stay here again. This is a great small motel which is well located in Chermside. Whilst it may be a few years old it is very clean and comfortable offering all the expected amenities. The Managers were also extremely helpful.